The event was launched by the Army Band sounding tunes with a Samba twist whilst the Brazilian Army’s 1st CBRN Defense Battalion was ready to kickstart the multi-agency live capability demonstration. The agencies involved in demonstration of the reconnaissance, identification and decontamination capabilities in responding to a chemical spill on the road included the 1st CBRN Defense Battalion of the Brazilian Army, the Military Police, the Military Fire Brigade and Medical Services. We saw a triage of victims, personnel and vehicle decontamination station and continuous monitoring of the contamination levels of the victims, the responders and the vehicles that were suspected to have come in contact with the agent. The demonstration gave insight into the capabilities of the Brazilian agencies, the current equipment used and the procedures to be followed in the case of an attack. Some vehicles from the live demonstration, including a mobile laboratory, remained for the duration of the event as a static display for delegates to visit and ask questions. Following the live demonstration, the conference was opened by Mr. Ilja Bonsen and Ms. Anna Paternnosto from the CBRNe Society introducing our conference chairman, Mr. José Zea Aguero, President of Centro de Information Quimíca (CINQUI), Perú who mediated discussions throughout the three-day event. The first speaker, Col. Alexandre Marcos de Vasconcelos, Commander of the 1st CBRN Defense Battalion of the Brazilian Army, outlined the role of the Battalion showcasing during the live demonstration a few hours prior, had during High Visibility Events (HVEs) in Brazil. The opening plenary also welcomed Col. Marcos Carvalho Barcellos, the Director of the CBRN Defense Institute of the Brazilian Army (IDQBRN) and insights from the Brazilian’s Ministry of Science, Technology, Innovations and Communications. Finally, Mr. Adolfo Cristanini, President and CEO of Cristanini described the decontamination equipment used by forces all over the world. The Opening Plenary was followed by the first NCT Expo Tour, with guides taking groups of delegates from booth to booth in the exhibition area, allowing commercial representatives to briefly demonstrate their CBRNe, C-IED and EOD solutions. At the end of the day, all delegates were invited to join the NCT Churrasco BBQ Reception at a paradise location on the Forte Copacabana. With views on the private beach at our feet, a caipirinha in hand, the surprise appearance of a plane pulling a Cristanini Banner set the scene for a great evening. What a great way to end day one of NCT Sur América 2019 Event - truly a magical experience! The second day was launched by Cap. 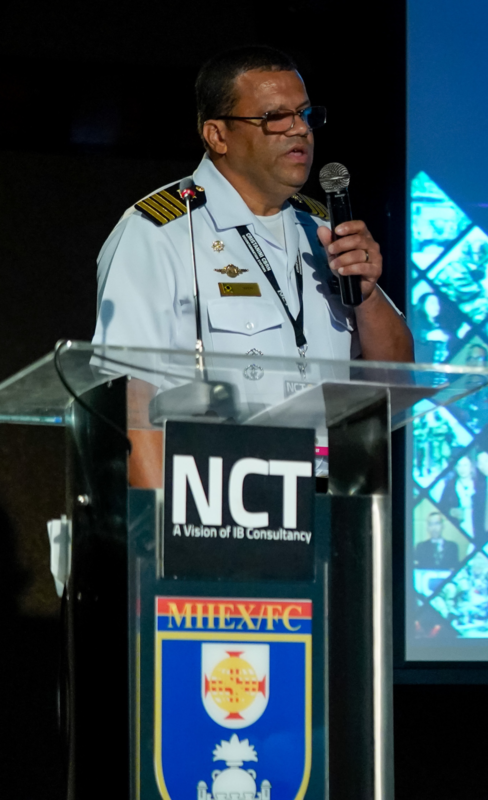 Roney Magno de Sousa, Chief Instructor of the DQBRN Division, School of Specialized Instruction of the Brazilian Ministry of Defense and followed by the second NCT Expo Tour. This gave delegates the opportunity to join a different tour from the previous day, viewing demonstrations from other solution providers for challenges faced by military and civil responders, and operators in responding to and preparing for CBRNe, C-IED and EOD emergencies. The sponsored lunch by Cristanini was yet another networking opportunity for delegates to discover the novel technologies showcased, to ask questions relevant to their field and finally to network with other agencies or companies. In the afternoon, we welcomed a presentation on CBRN detection from Dr. Ing. Andreas Walte, General Manager, Airsense Analytics GmbH, Germany introducing technologies available whilst a novel means of cooperation was introduced by the Brazilian Intelligence Agency. The final session of the day focusing on “Explosives: the “E” in CBRNe” gave an interesting Brazilian perspective from Captain Marcio da Mota Xerem, Commander of the Brazilian Navy NBCR Defense Center of the Brazilian Marine Corps combined with international input from Mr. Alberto Sanchez, Regional Sales Manager CBRNE, Bruker Detection, Germany focusing on Aviation threats whilst the Colombian National Army representative discussed Colombia’s terrorist threats. Finally, the day closed with Mrs. Andrea García Centurión, Chemical Instructor in School of Engineers of the Army discussing the topic from the point of view of Uruguay’s National Army. The second day ended with another edition of the famous NCT Networking Reception in the Exhibition hall with views on Copacabana beach. This gave delegates the opportunity to further discuss topics addressed in the conference over a classic lime, strawberry or passion fruit caipirinha from our favorite bartender from the night before. The NCT networking receptions were definitely the highlight of the event! That same evening, most of the NCT Sur América delegates managed to return to the hotel and to their homes shortly before the storm hit. With one of the strongest storms Rio de Janeiro has experienced in the last 5 years, we would like to extend our condolences to those that lost their loved ones during the horrifying natural disaster. We would also like to thank all the soldiers on the Fort and the delegates for the support that was provided in reassembling the event space, allowing for NCT Sur América 2019 to continue. We would like to thank all the speakers that held a keynote speech without presentation on the final conference day, due to an electricity cut because of the storm. The conference was honored to welcome Brig. Gen. (Med.) Eduardo Serra Negra Camerini, Director of Health and Social Assistance, Ministry of Defense, Brazil introducing “Medical Preparedness in CBRNe”, followed by insights from the Ministry of Health of Brazil. Following a short break, the program closed with an international perspective on CBRNe threats including a presentation on CBRNe training in Argentina, from Comandante Raúl Dominio, HAZMAT Specialist, Firefighters Academy, Argentina as well as an introduction to international cooperation from Dr. Ron Hann, Director, Chemical/Biological Technologies Department (J9CB), Defense Threat Reduction Agency DTRA, USA. Finally, our future partner Colonel Friedrich Aflenzer, CBRND Officer - Force Development Division, of the Federal Ministry of Defence Austria introduced the Austrian perspective, in preparation for NCT Europe 2019 taking place from the 25th to the 27th June of this year! Once again, the CBRNe Society was delighted to welcome high-level speakers, key experts and experienced operators from Brazil, from the region, namely Argentina, Chile, Colombia, Perú and Uruguay and from the rest of the world in contributing not only to an interesting NCT Sur América 2019 program, but also to a successful event. We hope to see you soon at our upcoming NCT USA 2019 event taking place in Washington, D.C. from the 7th to the 9th of May 2019! To check out the pictures and videos from all of our 2018 events, you can visit IB Consultancy's Facebook or Vimeo Page.